The whiskies of Ardbeg are usually heavily peated malts. Compared to other Islay malts Ardbeg doesn’t focus on the sea and salt tastes. They rather focus on aromas of spices, malt or sweet tones like vanilla and chocolate. The core range of Ardbeg consists of the Ardbeg TEN, Uigeadail and Corryvreckan. The TEN is named after its age. Uigeadail was named after the Loch Uigeadail a lake. The Corryvreckan is a famous sea vortex between the Isle of Jura and the Isle of Scarba. Recently the Ardbeg distillery brought out quite a number of special releases with no age statement (Supernova, Ardbog, Alligator). These bottles are highly advertised, quite special in taste and very limited to in quantity. The production volume of around 1,000,000 litres is quite large for a two pot still distillery that only produces single malt whisky. Ardbeg doesn't supply its spirit to the blended whisky industry, but sometimes a few barrels reach the independent bottlers so there are quite a number of independent bottles on the market. The Isle of Islay is an island with quite a lot of water sources, so the Ardbeg distillery can get its water sources from two main water sources: the Loch Airigh Nam Beist and the Loch Uigeadail. Ardbeg distils its whisky twice. The wash still has a capacity of about 18,000 litres and the spirit still of about 17,000 litres. Both stills have quite a tall neck and are constricted just above the conical neck of the pot still. The lyne arm is also rising after the bend. All these factors result in a stable distillation with a lot of reflux, which filters out the sharp and alcoholic tones that you taste in cheap spirits. The still house of Ardbeg is so small that the condensers of Ardbeg are on the outside of the building. This means the Ardbeg distillery has less building to maintain, but the copper surroundings of the condensers are subjected to a lot of corrosion and have to be replaced quite often. On the other hand, the condensers work better in the cool outside air instead than the heated still house. The spirit safe of Ardbeg is one of the smallest there is in the business. It just has the minimum you need to separate the middle cut. Moreover, the spirit safe is mounted on the spirit receiver in order to save space. The malting was done at the Ardbeg distillery until the beginning of the 1980s. Up until then Ardbeg malted the barley on their own malting floors and dried it with their own kiln and cut peat in the marsh above the distillery. Today Ardbeg buys their malt from the Port Ellen maltings with a high peat smoke content. The usual phenol content of the barley is said to average around 55 ppm. Ardbeg has a lot of warehouses on Islay, the most famous one is the number 2 warehouse as it has never been painted white like all the other buildings. Ardbeg usually uses Bourbon casks, but occasionally you get some sherry casks to sweeten up some of their bottlings such as the Uigedail (10% sherry casks) or the famous Lord of the Isles. The weather on the Isle of Islay is quite constant due to the Gulf Stream. The lowest being about 4°C (39°F) in January and the highest about 14°C (57°F) in July. This results in a very slow maturation and less angels' share. The Ardbeg distillery was officially founded in 1815 by John McDougall. But whisky was distilled there long before that. There are no documentations, as Ardbeg was an illegal business back in 1794. 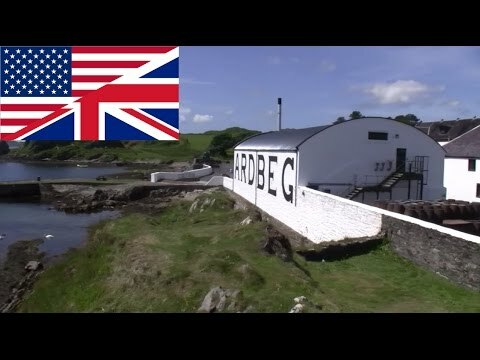 So McDougall probably didn't build the Ardbeg distillery himself but bought it from the former owners and opened it officially under his name. The name Ardbeg comes from the Gaelic word 'ad bheag' for small hill. In the early years the sales of Ardbeg were high and in 1835 they even had to raise production to meet the high demand. In 1838 the distillery became insolvent and was bought by a spirits dealer from Glasgow named Thomas Buchanan. He now owned the distillery, but it was still run by the McDougall family. After the death of Alexander, the son of John McDougall, the first women in history became distillery managers. They were Alexander's two sisters Margaret and Flora. They now managed the distillery together with Colin Hay. In 1853 Colin Hay became the owner of the distillery and ran the business with his son, who later followed his footsteps. In 1922 the distillery was bought by the McDougall family again. After a few managers at Ardbeg the distillery finally went bankrupt in 1932 and was closed during the depression. After the depression the distillery was run by the McDougall family until 1959, when the Ardbeg Distillery Ltd. was founded. After a takeover in the 70s by Allied Distillers the distillery was closed from 1981 until 1989. The reopening began slowlyas the distillery only distilled whisky for two month a year under the flag of Allied Distillers Ltd. Finally in 1997 the Glenmorangie Plc. bought Ardbeg and reopened the distillery for good. The brand was launched with a new design. This is the design we currently see. In 1998 the distillery got its own visitor centre and cafe, the Old Kiln Cafe. They are both on site and in the typical Ardbeg design. In 2004 the Moet Hennessy company acquires Glenmorangie and therefore Ardbeg belongs to Moet Hennessy now. The Ardbeg visitor centre is open all year and during the summer you can even visit the distillery on weekends. There are three different tours, on which you can experience Ardbeg's history. The top level tour even lets you take part in the production process and includes a cask tasting in the warehouse. You can even book a night at the Seaview Cottages right next to the distillery buildings. Share your experience with other whisky lovers. Write a note about your trip to the Ardbeg distillery. Excellent tour and interesting knowledge. The warehouse tasting was authentic and comforting. Ardbeg takes it's time for the visitor and treats you with most respect so that from start to finish you feel cared about and comfortable. Small distillery with great attitude. Ardbeg opens "The Kildalton Project". The project is set up with the NHI to support weak, rural communities in the Highlands.